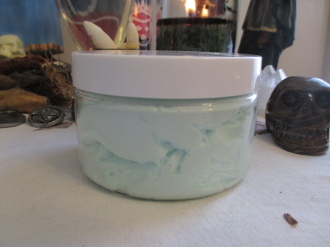 After so much amazing feedback about my Queen Isabel Water, and with requests from clients, I am now offering my revitalizing water in a luxurious, rich, thick body butter! This legendary formula was created during the 14th century for Queen Isabel of Hungary who was paralyzed in pain Some say it was her master herbalist, some say a magician, who concocted this formula initially with the intent of providing relief She was given a vigorous, full-body rub with this formula each day. They soon found out that it provided miraculous, youth-restoring results. Allegedly queen Isabel was soon up and dancing and engaged to the much younger King of Poland who became impressed with her beauty, youth, and vigorous spirit. Being Hungarian I have heard this story many times and my family always has some of this around. It is also very stimulating to the mind as well, due to it's ingredients, so it's great to apply in the morning, after a long night, before studying, or before an interview. I can not divulge my entire recipe here, obviously, but I can tell you it is created from a base of the finest (and expensive!) ingredients; neroli and rose water, with rosemary, spearmint, and neroli essential oils, and rosemary and vervain herbs. The rest is secret;) It's a very green, fresh, stimulating scent. I LOVE this stuff and I really think you'll be pleased too. It is a wonderful way to clear your mind, refresh and renew. Perfect for magickal or mundane uses! Clients have told me that it is a miracle cure for unexplained ailments such as pains and rashes. feedback from my Queen Isabel Water; "Amazing stuff! Had some shoulder pain from a pulled muscle recently. I applied this along with some old fashioned heat; two days later I have minimal pain, and a fully functioning shoulder!" "I have to admit. This is amazing. Works almost instantly. I apply in the morning and before bed. I suffer from joint problems due to autoimmune disease and I truly believe this has given my symptoms a swift kick in the rear." "I splashed this on and my migraine disappeared!" "All I can say is this took me by surprise! I have a neck "tic" where my head jerks for nor reason ll day and night. I have been to several doctor and hospitals and two neurologists...I have been told there is nothing they can do and it has worn me out. I am tired and my neck is in so much pain some days I wonder if I can take it. Anyway I came back to order more of your glorious items and thought to try this for other reasons. I put some on before bed just to try it out. I woke up for the first time in nearly two years without neck pain. I thought hmmmm this is odd. Then I noticed my tic had lessened.....so I thought very strange. Anyway if this keeps up I will have to admit you have made miracle in bottle!!! I had lost hope for this condition when the last neurologist said I will be like this forever. Being only in my 30's that was very grim news as I have felt like this is killing me. I will be using this daily and hope to get my total health back! BTW this order contains the best smelling oils I have received from you yet. Will give more feedback on the rest later once they are used. I appreciate your gift love to you and yours Sarah." "I've shared my success with your Queen Isabel of Hungary water before, but I just wanted to take a minute and tell you again how truly amazing it is. I suffer from runner's knee, and I was experiencing a lot of pain yesterday. Last night, I decided to rub the water on the front and back of my knees before I went to bed. I hadn't taken any type of over the counter pain medicine; just a hot shower. When I woke up, I couldn't believe how my knees felt!! I'm SO grateful for this and for you sharing it. Thank you from the bottom of my heart!!! " thanks for looking! curio only. Â© Conjured Cardeaâ„¢ 2009. No part of the content, designs, photographs, product trade name(s), trade product design(s), intellectual property, and product(s) can be used without prior express written permission. All rights reserved.